The world of virtual reality in video games has explored places never seen or experienced. In these scenarios, the landscape and everything that goes with it is new and springs from someone’s imagination. But what if VR tries to recreate someplace that is very well known and puts the player inside that location? 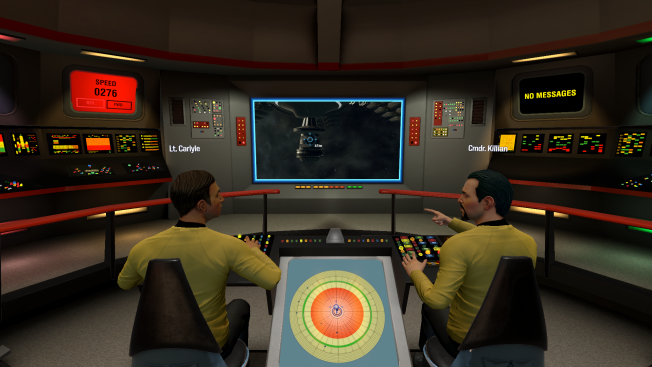 In “Star Trek: Bridge Crew,” developers not only let you see what it is like to be on the bridge of a Federation starship but also allow you to take control of different positions, including being the captain. For a “Star Trek” fan, this is a dream come true. Whether you are aboard the U.S.S. Aegis, a newer starship, or the legendary U.S.S. Enterprise (the first one), the attention to detail by Red Storm Entertainment and Ubisoft is meticulous, lovingly rendered, and reflects the passion of those who loved the television series and the movies. David Votypka, senior creative director at Red Storm, felt a little bit of pressure to get things right, but he wanted it to be more than just a recreation. The VR experience is best done using hand controllers, which allows the players the freedom to use their hands in a more natural motion. Whether captain, engineer, helm or tactical, the roles intertwine and create a sense of team to complete the missions. It is a smooth experience for the player and doesn’t create any motion-related illnesses that can come with a virtual reality game. The calm motion, when not in a firefight situation, also allows players to really get a sense of how vast and complex the bridge of a starship can be. David Votypka, senior creative director at Red Storm, and super fan James Cawley sit in Cawley's reproduction of the bridge of the U.S.S. Enterprise. Whether on the Enterprise or the Aegis, Votypka and his team created a unique sense of actually being on those starships. Fortunately, they had many years of source materials to make sure they could produce that feeling, both visually and aurally. Whether it was audio tracks from the films or TV shows or video that play on the background screens on the Enterprise, the developers had a lot of material from which to work. Votypka said it was all very helpful in allowing them to get the finer details while still using them as springboards to tell the stories they wanted to tell. Some of the most meticulous information as to the look and feel of the Enterprise bridge came from a super fan, James Cawley, from Ticonderoga, New York, who built a life-sized replica of the starship from the original TV series. Cawley used screenshots from DVD and Blu-Rays of the original series to help him build his “starship.” He also spoke with set designers who worked on the series in the 1960s to find out what they made their props with and how they constructed each piece. All that attention to detail is great, but it only becomes truly immersive in a game setting where players can naturally interact with one another. 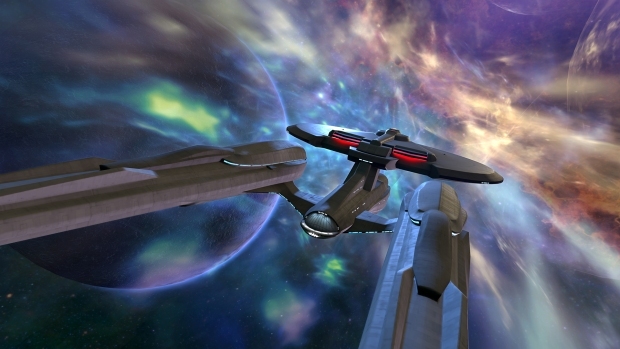 Social VR, allowing players to interact with one another through voice or gesture, gave the starship bridges a new sense of reality with the natural movements of the players. Whether in solo mode or in co-op with other players, “Star Trek: Bridge Crew” hopes everyone gets the feeling they are in starship missions. The missions aren’t all combat, but like their inspirations, the starships also explore, find new discoveries, help others when they can, and put them in situations where there is not necessarily one right answer. “That’s such a common theme in ‘Star Trek,’ where they come upon a situation, and there is no obvious choice here, and we just have to make the best moral decision we can or the best decision that reflects the intent of Starfleet,” Votypka said. Much like those starship, the game also has its unique computer partners. IBM Watson, and its interactive speech and cognitive capabilities adds another layer to let players use their voice and natural-language commands to interact with their virtual Starfleet crew members. Watson can operate a crew of just AI characters or mix in with other human players without breaking the immersion of the experience. Think of it as having another Vulcan on the bridge. Votypka doesn’t want people to think this is only for “Star Trek” fans. He hopes the lure of the detailed experience in virtual reality will get other people to dive into the universe. “Star Trek: Bridge Crew” is available now for Oculus Rift, PlayStationVR and HTC Vive. It is rated E 10+ for everyone 10 years of age or older due to fantasy violence.